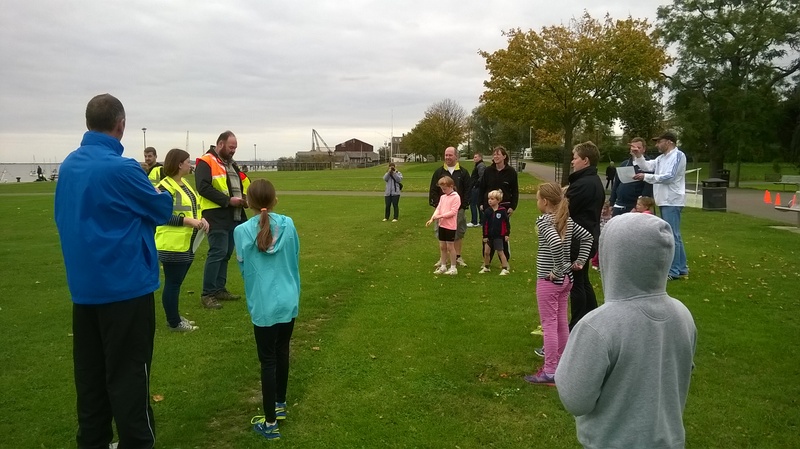 Back in June I put my name down to volunteer for a junior parkrun event which at the time was very much in its embryonic stage. Shorne Woods’ parkrun regulars, Matt Baxter and Becky Robertson, have worked really hard over the intervening months to get the run off the ground – including securing funding from Gravesham Borough Council and identifying a suitable location – and this Sunday saw the test event for the run which will take place each Sunday morning in Gravesend. The inaugural run takes place next Sunday, 2 November and details can be found on the website here. 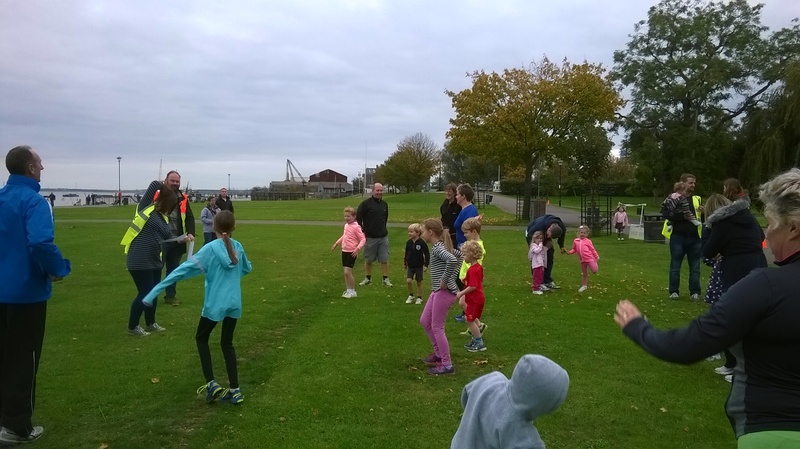 Junior parkruns are based on exactly the same model as the original version – open to all whatever your ability, free, timed and manned by volunteers. The difference is that they are open only to children between 4 and 14 and the run is 2k rather than 5k. Adults are allowed to run with their children but they have to veer off before the finish line so they don’t get a time! Initially, Matt and Becky had hoped this event would be the first in Kent but they were pipped to the post by an event which started a few weeks’ ago in Whitstable. Hopefully these will be the first of many in the Kent area. They are certainly beginning to spring up all over the country. I think when I first looked, there were four! Now? Well just look at the map! As the test event got closer, I put my name down to try out the time keeper role, a role which bears great responsibility. I’ve always been in awe of this role when volunteering at parkrun. How on earth do you cope when you have a large group of runners heading towards the finish line? Would my stopper finger go into overdrive? Supposing I missed a runner? The possibilities were endless! The operation of the timer was actually quite straightforward in the end. 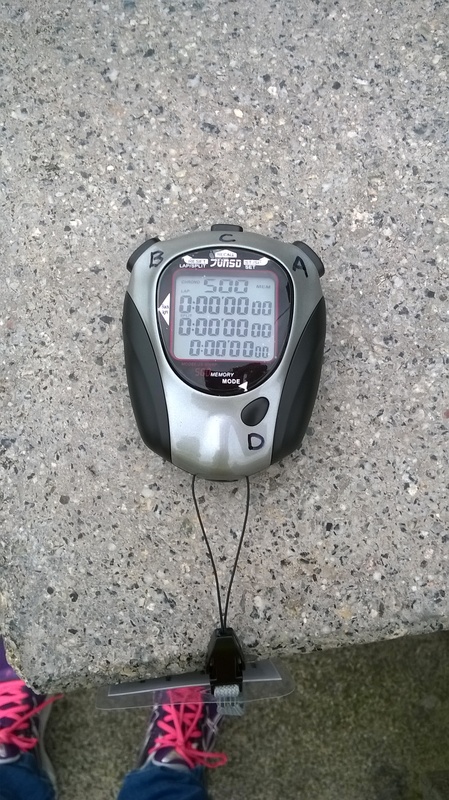 Press Button A when the run starts, press Button B each time a runner crosses the finish line, and press Button A again when all runners have finished. Even I could cope with that early on a Sunday morning. And of course volunteering meant I got the opportunity to don a hi-viz jacket – the ultimate in parkrun haute couture! Matt and his son, Oliver, modelling the parkrun hi-viz jackets! We had nine runners cross the finish line in the end. There were a few more at the start line but somewhere along the course it all got a bit much for one little girl and there were a few tears. Perhaps she took a leaf out of my book and realised she’d peaked too soon with all that pre-run activity. But I’m sure she’ll be back to complete her run. With all the media coverage on childhood obesity, initiatives like junior parkrun can only help to encourage children to get more active, surely? And hopefully as the run expands, it will help inspire community spirit in the local area. There were certainly plenty of people milling around the Prom this morning so perhaps we’ve spiked their interest and they’ll come along next week with children and/or grandchildren to join in. So well done Matt and Becky for getting Gravesend junior parkun off the ground. I don’t know about the children of course, but I’m certainly looking forward to next Sunday morning. So here’s a link to my friend’s blog post about Sunday’s run from a spectator’s viewpoint. 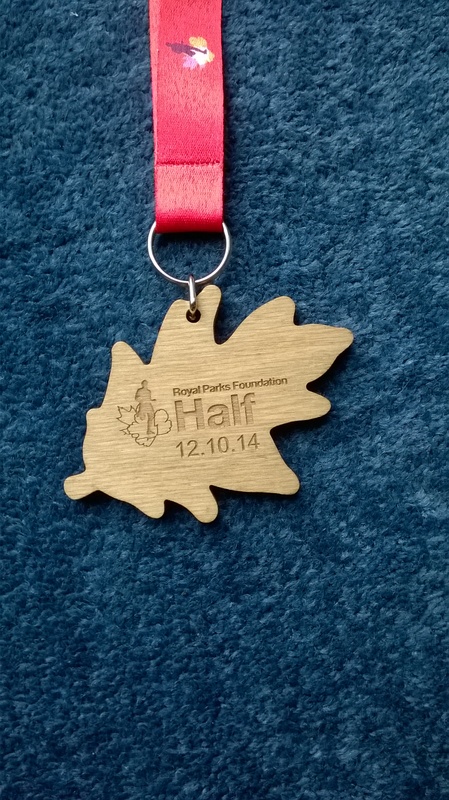 And as the dust settles over yesterday’s Royal Parks Half Marathon, I ask myself what’s next in my running world? I feel I should be a tad disappointed with my eventual time but surprisingly I’m not. There are a couple of things I’m happy with. For the first time ever, I didn’t go off too fast. I kept up an even 6 minute/kilometre pace most of the way around which would have resulted in a finish time I’d have been happier with even though it wouldn’t have been a PB. I managed to run a lot further on this occasion than back in 2011. That year I did go off too fast and was walking probably from about mile 6. Yesterday, mile 11. It started feeling a bit difficult around mile 9 but I was determined not to give in before mile 10. At that point I tried telling myself there was just a parkrun to go and there was a bit of a decline ahead, so that determination continued to mile 11 – just! But at that point it became a walk for a minute, a run for 4. And as is normal with me, once walking is introduced, it reappears again. I think in all probability there were about four or five 1 minute walk breaks in those last two miles. It was sheer frustration though when I turned the final bend to come face to face with the 20k sign! My watch was telling me I was already well over 20k. It was the thought that I only had metres to go which was keeping these little legs going. Fortunately there was a slight decline to the finish line so once I got to 800m I did manage to carry on running (slowly) to the end. So I finished in 2 hours 9 minutes and 17 seconds, a minute and a half quicker than last time so a PB of sorts. My watch told me I actually ran 21.47k so I console myself with the fact I ran further than I needed to. Technically a half marathon is 21.097494k so I did an extra 0.37k. On this occasion I also had spectator support in the form of my friend Lexi and I know she plans to blog about her experience of the race but some of the most notable events of the day for me included. It’s really quite amusing to see the women subsequently emerging with a pained expression on their face, saying “it wasn’t me” or “it’s not nice in there” or just avoiding eye contact altogether! Anyway, I digress. I literally emerged from the portaloo, ran across the park to say goodbye to Lexi and managed to get into the start funnel just as they were counting down the start of the next wave! Thinking positively, at least I didn’t have any of that hanging around in your funnel, waiting for the start, trying to decide whether to move past the group of runners in front of you who look intent on running in a line, chatting the whole way around and blocking your smooth passage. Crowd support – absolutely wonderful! If you’re running for a charity and you have the option to iron on those letters spelling out your name, do it! Never underestimate how much of a boost you’ll get hearing a complete stranger calling out your name, even if you suspect that they might have already cheered you on at least once already! The noise at certain points around the course was almost deafening but it’s so overwhelming when people cheer on random strangers even when they’re probably only there to support their own loved ones. And the best sign seen (twice) on the course? The one that said “I’ve been training for months to hold up this sign”. It made me smile anyway. Passing the squirrel, yup, that was a good one! Being passed by a bloke with a huge cool box attached to his back, annoying! Apparently he was a “ninja turtle”?! Once having crossed the finish line and meeting up again with Lexi, I was greeted with “next time …”. Next time?! Give us a chance, I’ve only just finished. But I suppose the fact that she’s prepared to accompany me again is a good thing and she enjoyed the experience?! Another plus point, throughout the run I had no problems with my troublesome ankle or my ballet jam tight calves. I felt it (and am still feeling it) more in my thighs. And despite running 21.47k yesterday morning, amazingly I managed to run for the train (we missed it). I’m still not quite sure how I did it but adrenalin must have kicked in. And I thought running 13.1 miles was going to be my only problem this weekend. It appears not! As I write this blog post, I am sitting on the floor with a hot water bottle under my calves because this week I decided would be a good week to attend my first Ballet Jam class. Wrong! The class was very good and worked up a sweat, although not the sweat which Burlexercise managed to work up the week before. Again, co-ordination was a problem. Arms and legs were everywhere and not necessarily where they should have been at that particular point in time. I probably wasn’t quite as graceful and elegant as I imagined myself in my head, but I managed to keep going through the whole hour. As a runner, I’m sure in time I will reap the benefits of attending further classes by virtue of stronger ankles and calves but at the moment I’m wondering whether I’ll be able to run at all by Sunday. All hopes are pinned on time and my sports massage tomorrow. It is currently painful to climb stairs and I’m not even going to try to run in case I snap something. My calves are extremely tight from all that bounding around in arabesque, jetés, pas de chat, etc. Now if this was the only problem I had to contend with that would be one thing, but I also have to face extremely frustrating travel arrangements. The race starts at 9.00am and is on a Sunday so we have engineering works and hourly services to deal with. All options have been explored, and believe me there are a few around here, but what is the point of having a high speed rail service on your doorstep when the first train on a Sunday isn’t until 7.48am?! I wonder if Eurostar runs any earlier services? Perhaps if I take my passport, I can hitch a ride on the 6.30am from Paris!!! So the current plan is to get a train which takes me into London Victoria. Only problem – this is an hourly service on a Sunday so if I miss the 7.04am, I wont be doing the run. But assuming I do make it, at least I’ll be properly warmed up. I’m assured it’s only a 15 minute relaxed walk from Victoria to Hyde Park. We shall see! This time next week, it’ll all be over – presumably! 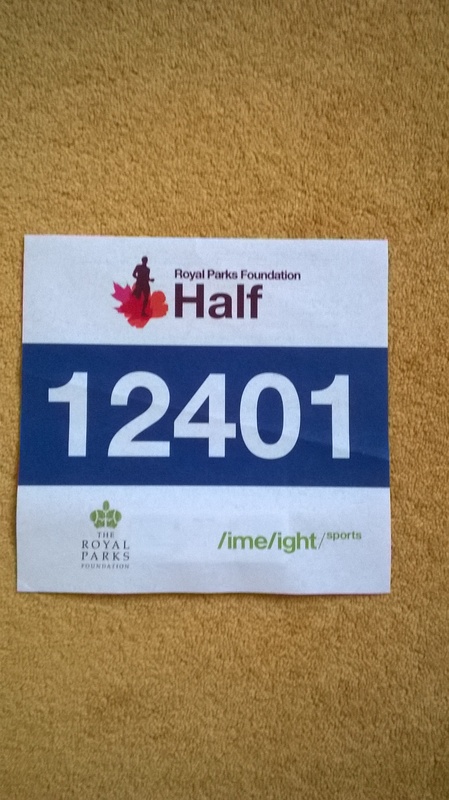 I mean my second attempt at the Royal Parks Half Marathon and hopefully a better performance than my first attempt in 2011. This week is obviously going to be quiet on the running front but I can’t help feel my taper might have started just a little bit too early and might be just a little bit too relaxed! Depends whose taper plans you read, I suppose. I’ve seen some that suggest a 10 mile run this week should still be on the cards. Maybe if you’re young and fit (or older and fit). But I’m not following that plan. I’m just going to stick to a couple of 5k runs at the beginning of the week. I have a sports massage booked for Friday and I’m tail runner (hopefully walker) at Shorne Woods parkrun on Saturday. To be honest, it’s not now the distance that’s bothering me about the run. It’s the logistics of getting there in time for the 9.00am start and the fact the organisers suggest you should be in your starting pens at 8.40am. Excuse me, but I need to go for a “comfort break” at least twice before the start of the race. Naturally I need to make sure I’m properly hydrated but some of that hydration needs to vacate the premises before I start running. And obviously there are going to be long queues! And I’m not using a Shewee before anyone suggests it! Anyway, the long and the short of it is that it’s going to be a very early start for a Sunday morning! Back to this last week. I’ve only managed two 5k runs this week. The first was on Wednesday evening and although the time wasn’t particularly brilliant, my legs did feel very “bouncy”. I’m putting this down to the yoga session I’d been to in the morning. 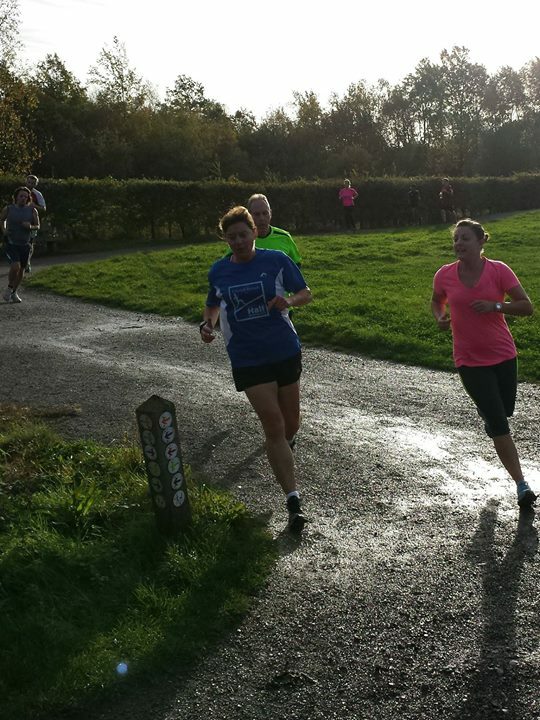 The second 5k was obviously parkrun yesterday. For anyone who missed the BBC’s little item to coincide with parkrun’s tenth anniversary, check out this link. I had intended to go for another run on Thursday lunchtime but I thought better of it in the end because I was planning to travel up to Fulham to attend a Burlexercise class in the evening. I thought it might be an idea to save my energy and it was just as well I did! OMG, that was so much fun but I don’t think I’ve sweated so much – ever!! The class is described as a medium to high intensity all over body workout which incorporates showgirl elements. I will be writing about my experiences in more detail next month on a new website “Lexi and Jones” (written in conjunction with my co-conspirator Lexi Welch). But if anyone is interested in trying a Burlexercise class, check out their website here. I would thoroughly recommend it and if I ever come into a lot of money I will be renting a little pied a terre in the Fulham area so I can go on a weekly basis. Then one day I might have a chance of “refining” my showgirl skills! “Lexi and Jones” by way of explanation is our attempt to help women find a healthy way to traverse the tricky “middle years”. We hope that we might inspire and inform others with our efforts, some may say foolhardiness! The plan is to issue a monthly e-edition covering nutrition, exercise and life in general and anything else which comes our way – including cocktails 🙂 Feel free to check us out here. Feedback and contributions would be gratefully received. Finally, like thousands of others around the country, I experienced a massive disappointment this week. I received one of THOSE letters. You know, the ones that said SORRY rather than YOU’RE IN. 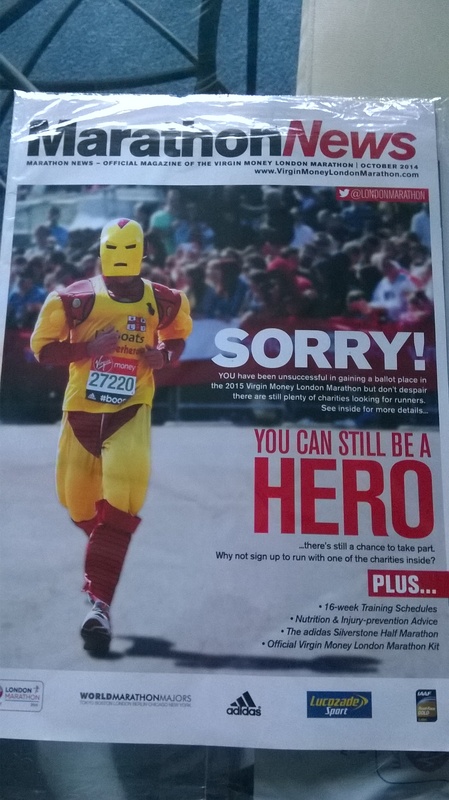 Yes, after a six months wait, I now know I do not have a place in next year’s London Marathon. On the Tuesday I noticed my Twitter feed was full of people decrying the fact they’d got their Sorry letters and as my post hadn’t brought anything similar, I began to get just a little bit excited that I might have got a place. I say excited, I do not exaggerate when I say I also felt just a little bit sick! Anyway, needless to say, on Wednesday, I got my letter and it was a no. I tweeted my disappointment and I almost instantaneously got tweets from two charities offering me one of their places and another from the organisers of the Edinburgh Marathon. Oh the power of social media! As it happened, Lexi was with me when I received the letter and I seriously think she thought I was going to cry when I realised I didn’t have a place. Nay, whatever, I’m over it! There’s always next year or the year after. And think of all the training I don’t have to do! Lexi & Jones Goes Live!